Valentino Rossi came within 0.366s of a fairytale return to MotoGP in Germany as he lost out at the end of a monumental scrap with Ducati rival Casey Stoner. Rossi produced an all action display just six weeks after breaking his right leg in Mugello and he was seconds away from a stunning rostrum finish. In the build up to a thrilling climax to the 21-lap race, Stoner and Rossi had produced an exhibition in braking manoeuvres as they constantly switched places from lap 15 onwards. The 31-year-old looked like marking his injury return in style as he led Stoner for the majority of the final lap. 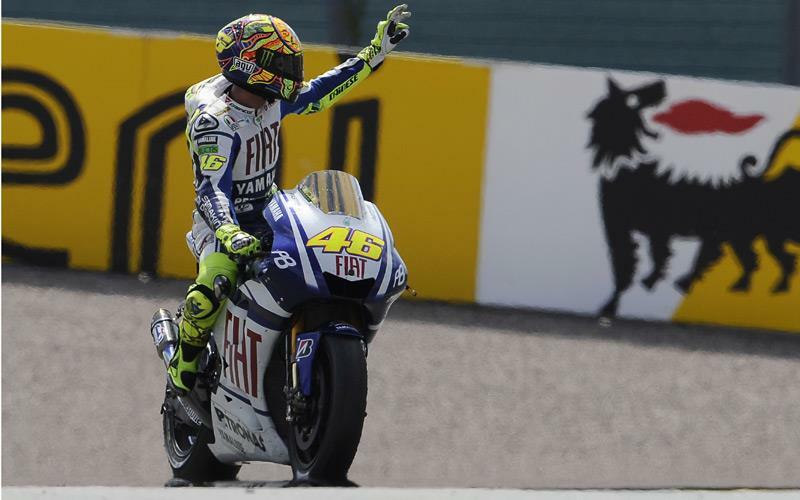 But as he tried to defend at the final corner, Stoner craftily steered his Ducati GP10 on the inside of Rossi’s Fiat Yamaha to win the short drag to the finish line. Stoner’s resilience consigned Rossi to fourth but the nine-times world champion could hardly be disappointed as he marked his comeback with a ride full of grit, determination and skill. Rossi, who was testing a Yamaha R1 World Superbike machine in Misano just 32 days after breaking his right tibia, was elated with fourth. He said: “I didn't expect this! I thought it was maybe possible to make fourth or fifth place but I thought it would be very difficult. "In the end I was fourth but I had a great battle with Casey and I was so close to the podium, so this is a fantastic result after missing four races. "I need some more kilometres to really recover the feeling and feel completely okay with the bike again, but I think I did a great job and this was a very good comeback, better than we could wish for. "I felt a bit of pain in my shoulder but more in the leg when changing direction, but at the end the battle with Casey was such fun that I didn't think about it. Rossi said he expected to have gained much more strength in his damaged right leg as he prepared to leave Europe and fly to California for this weekend’s American Grand Prix at Laguna Seca. He said: “My leg is not swollen and also my ankle and knee are moving well and it seems like every day U ride I feel less pain. So I hope next week to be even better." What delighted Rossi as well as his fourth position was the way in which is troublesome right shoulder had stood to its first severe test since early June. Rossi damaged ligaments in his right shoulder in a motocross training accident in April and he feared it would cause him problems than his leg. He added: “ What I am more happy about is the shoulder. I had lot of pain in Jerez and Le Mans and also at Mugello, but when I stayed 15 days in bed my shoulder became more tight and I lost a lot of movement. "I was very frustrated and very worried to do another operation but I work a lot in the swimming pool and in the race I had no pain." So does he head across to the US confident of adding to his solitary Laguna Seca success in 2008? “The target is to try to make a better result than Sachsenring, so I will be ready to try and win, “grinned Rossi.